The 2019 Africa Cup of Nations is going to be a one of firsts. For the first time in the tournament’s illustrious history, it is going to have a finals stage that involves 24 teams instead of the usual 16 that have qualified previously. Not only that though but the time of the year in which it takes place has also changed, whereas before it was played in January/February it has now shifted to June and July. With the reason being that the tournament is now in sync with other major international competitions. It might be something of a gamble and not one where you bet with virgin games, as the fact that the tournament was played at the start of the year meant that it stood out on its own in what is a very cramped international calendar. Now it becomes just another Summer competition. And although not a first, there has also been a change in hosts with Cameroon being stripped of their duties with less than six months before the first ball is kicked. A decision which has meant that Egypt now have the task of arranging Africa’s biggest footballing party. And it is a party that Nigeria have managed to earn an invite to after six years in the wilderness. Their last appearance at the finals stage of the competition was back in 2013, a year that they subsequently won the tournament. The Confirmation After The World Cup? The fact that they did not even qualify in 2015 and 2017 just highlights how cut-throat African football can be, one year you are at the top of the mountain and the next time around you’re not even making up the numbers. Thankfully though this seems to be a new era for Nigeria as they will look to build on their qualification to last Summer’s World Cup in Russia, with the highlight certainly being their 2-0 win over Iceland. 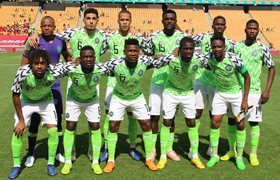 They may not have qualified for the knockout phase in Russia, but they certainly did not disgrace themselves either and the Super Eagles will be confident of going a lot further when they take on the best that Africa has to offer. And it is a tournament that they will have every chance of winning, especially when you consider just how wide open the field is in terms of favourites. A look at the current FIFA rankings sees Nigeria as the third highest ranked side in the CAF. The two nations that sit above them in that list are Tunisia and Senegal, both have also booked their place in the finals later this Summer and will be earmarked as two of Nigeria’s nearest threats in terms of potential competition winners. Rohr, The Man Of The Situation? The African Cup of Nations is undoubtedly a difficult nut to crack, something that Nigeria manager Gernot Rohr will be all too aware of. However, he will look to create the perfect code in a bid to lead his adopted nation to success. And he may well use this code if it means unleashing the likes of Arsenal forward Alex Iwobi on opposition defences, the only concern for manager Rohr is that his star man is not too fatigued after a long Premier League season with Arsenal. The question will be as to whether or not Nigeria can deal with the pressure that will come their way this Summer. Progress out of the group stage, will soon turn that doubt into belief, something that could propel them all the way to tournament victory in mid-July.